Another year has come and gone and left the kayak angling community longing for the next year already. Why you ask? Plain and simple, the 8th Annual YakAttack Kayak Fishing Tournament to benefit Heroes On the Water and Project Healing Waters is now officially in the books. This event draws some of the best kayak anglers from all over the US. This year we had representation from Maine all the way to Florida and points in between. The tournament weekend starts off with an awesome dinner that included this year: ribeyes, pulled pork, bbq chicken and all the sides that go with it. The weather was a bit challenging with rain over the last couple of weeks throughout the region. On tournament day, the rains moved in yet again and doused us for most of the day. I came into the weekend battling a sore throat and sever sinus congestion and headaches. Not a winning recipe for overall comfort and enjoyment, but thoughts of these things fell to the wayside as I unloaded all of my gear and prepared to launch. The format of the tournament is fairly straightforward. Four divisions in total: Largemouth Bass, Crappie and Panfish with a Slam for the best length of a single fish from each division. So you could theoretically not catch large fish but still win the slam for total length. After some brainstorming with fellow Hobie Fishing Team member Grant Alvis the night before, a plan was put in motion and I hit the water. The rains tried to dampen my spirit and had even forced me to reconsider staying out in the damp conditions in my current sickly state. Having not caught a single fish for the entire morning, I finally caught up to good friends Daryl Boyd and Greg Timmer (Hobie Fishing Team member from FL). We made a tactical decision to escape the wind in a small cove before heading back down lake. We took the opportunity to refresh by eating some food and hydrating with some water. This little respite revitalized and re-focused my energy. I set out again with a different mindset and decided to switch up my approach and opt for a thumpin' plastic over the preferred spinnerbait. I was immediately rewarded with two smallish bass, but still a rewarding situation given my production thus far. I kept at it with cast after cast and switching up casting angles, retrieve speeds, lure depths, etc. Another smallish bass came to play but was welcomed regardless. As the fishing window started to close, I decided to switch things up and try for some panfish and crappie back in a protected cove. I switched rods to my U/L spinning rod rigged with 6lb test line and a white Rooster Tail as the bait of choice. After 5 minutes of slinging it around the protected cove, I slowed down my retrieve to a crawl and slow rolled it back to the yak. The line came tight and started peeling off of my reel. When I first caught glimpse of the fish as it rolled, I knew I would have to baby this fish if I had any chance of landing it. After a good 2 minute fight, the big bass decided to chill out long enough to get it kayak side and be landed. Finally, a respectable fish to put on the board at 19 1/4". Well, that would prove to be my last fish on the day, since no panfish or crappie made an appearance for me this tournament, but I still managed to turn in 34.5" of fish as my two-fish submission. Sadly it fell 3" short of placing this year, but I still managed to enter fish. I still walked away with a cool assortment of goodies in the captain's bag, and I was one of the people fortunate enough to win a premium raffle prize - a new Hobie Fish Bag for keeping my salty catches in the future to feed my family fresh fish!! Saturday for the tournament is always fun, because of the raffle and fellowship that ensues once the fishing is done, but the main point of the tournament is the benefit aspect of it, and the raffle and tournament entry fees when totaled are estimated to exceed $22,000. It's an amazing tournament coupled with a meaningful benefit theme and fellowship that is unequaled in the kayak community. Luther and the whole crew at YakAttack outdid themselves yet again this year. I know that next year's event will be even better and am already longing for that Armed Forces weekend yet again! Tight lines everyone! Stay safe out there! I started kayak angling in April 2010 in a SOT (Sit On Top) purchased from Appomattox River Company. I have always been a freshwater angler primarily targeting Largemouth Bass. Since that time, I have ventured out into the saltwater more and more and have enjoyed my days chasing Speckled Trout, Summer Flounder, Striped Bass and hope to eventually catch a bull red, some Spades, Tautog and Sheepshead. 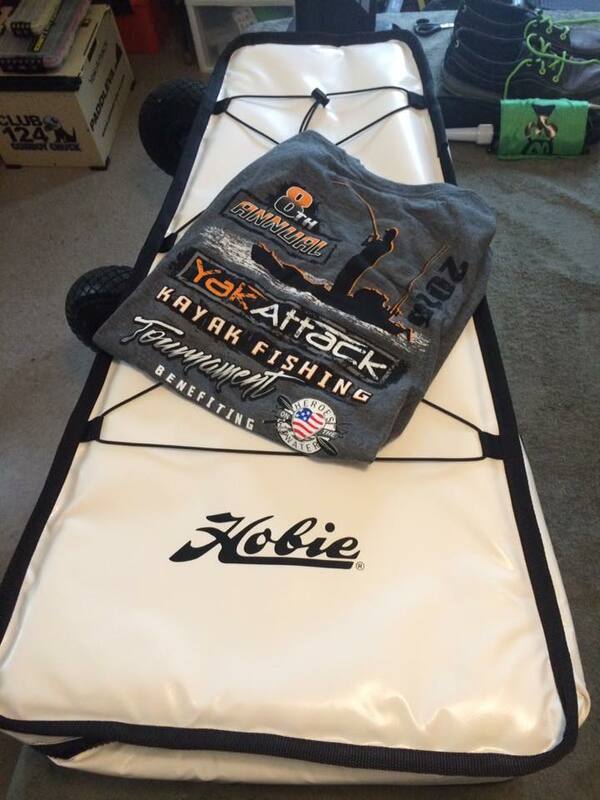 Currently, I am a member of the Hobie Fishing Team since 2013 as the Central Virginia Local Pro and have owned the following Hobie kayaks - Pro Angler 14's, Revolution 13s, Outback (2nd and 3rd generation), Compass and Quest 13 and find them to be more useful for the type of fishing I am doing but still enjoy the time spent in traditional paddle-based kayaks. I am also a member of the PowerTeam Lures, YakAttack Regional, Bull Bay Rods and Power-Pole Shallow Water Anchor Pro Staffs. I use Bull Bay Rods, Lowrance electronics, RAM Mounts and YakAttack rigging solutions exclusively. I look forward to seeing you on the water in the future!